Your Nikon D3400 camera offers six Scene modes, which select settings designed to capture specific scenes using traditional characteristics. For example, most people prefer portraits that have softly focused backgrounds. So in Portrait mode, the camera selects settings that can produce that type of background. 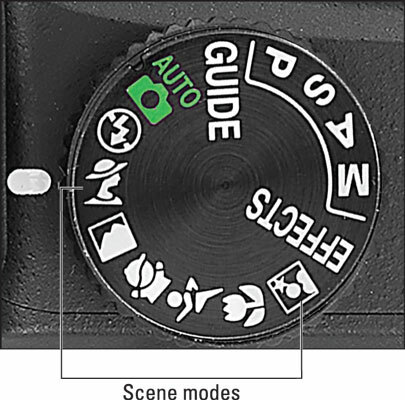 Scene modes are represented on the Mode dial by the symbols shown here. These symbols represent the Scene modes. Autofocusing during viewfinder shooting: The camera uses the AF-A Focus mode setting, which means that focus is locked at the time you press the shutter button halfway unless the camera senses a moving subject. In that case, focus is adjusted up to the time you press the shutter button to take the shot. For the AF-area mode, which is the setting that controls which focus point is used, the camera uses a different default setting depending on your Scene mode, so see the upcoming descriptions for details. In all Scene modes, you can dump out of the default AF-area mode if you choose. Autofocusing during Live View shooting: By default, the Focus mode is set to AF-S, and focus is set when you press the shutter button halfway. However, you can change to AF-F mode, which provides full-time, continuous autofocusing. As with viewfinder photography, you get the option to use the default AF-area mode, which varies depending on the scene mode, or to choose one of the other Live View AF-area mode settings. ISO Sensitivity: This option determines how much the camera’s image sensor reacts to light and, therefore, how much light you need to expose the image. Auto is the default setting. The camera then adjusts the ISO Sensitivity option as needed to expose the picture. To change the ISO setting quickly, press and hold the Fn button (located on the left side of the camera, underneath the Flash button) while rotating the Command dial. Release mode: The default Release mode is Single Frame for all modes except Sports, which uses Continuous (burst) mode shooting. However, you don’t have to stick with the default; to change the setting, press the Release mode button, located just under the Multi Selector on the back of the camera. Finally, understand that the results you get from any Scene mode vary depending on the lighting, your subject, and the range of aperture settings available on your lens. Those factors determine which exposure settings the camera can select, which in turn affects how much of the scene appears in focus and whether moving objects appear blurry.